When the Soviet Union collapsed in 1990, Cuba’s economy went into a tailspin. With imports of oil cut by more than half – and food by 80 percent – people were desperate. This film tells of the hardships and struggles as well as the community and creativity of the Cuban people during this difficult time. Cubans share how they transitioned from a highly mechanized, industrial agricultural system to one using organic methods of farming and local, urban gardens. 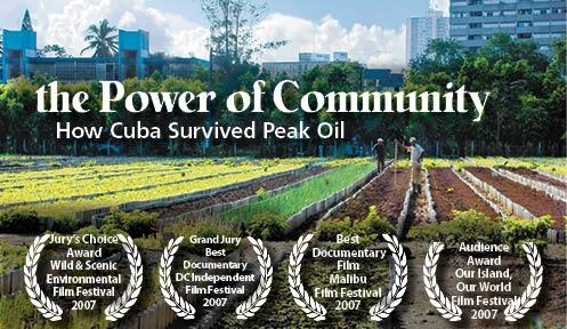 It is an unusual look into the Cuban culture during this economic crisis, which they call “The Special Period.” The film opens with a short history of Peak Oil, a term for the time in our history when world oil production will reach its all-time peak and begin to decline forever. Cuba, the only country that has faced such a crisis – the massive reduction of fossil fuels – is an example of options and hope.